Here’s an online shop to brighten your day. 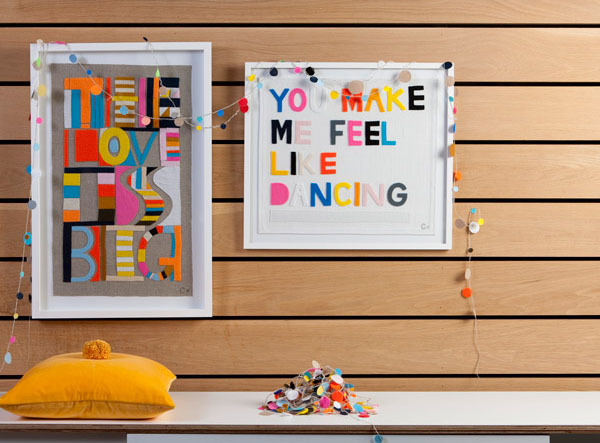 Castle and Things is a small hub of colour and joy that casts its happy vibe over product like fluorescent spotty bed linen and stitched felt artworks. A while ago we pleaded for Castle bedlinen to come in single bed size and guess what, now it does! Castle and Things bed linen is for adults and children. Cotton or velvet pillow slips are sold in sets of two with mix-and-match style in mind. 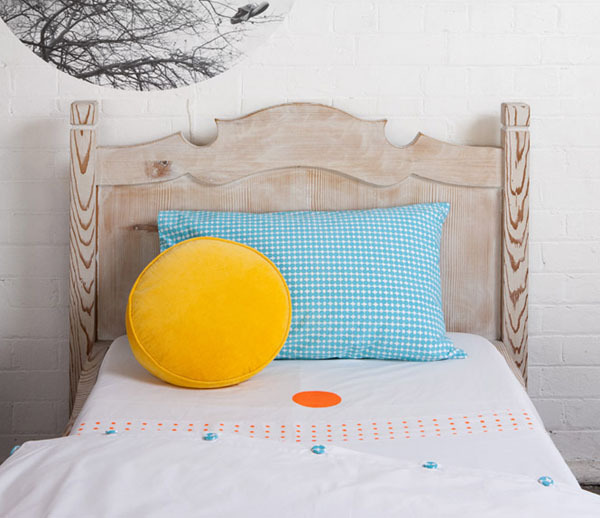 Base sheets and quilt covers come in crisp white with small hits of colour. The pillow slip shown above is called Blue Flower, $49 per pair. Also shown is the Fluro Orange Spot fitted sheet, $115 and the Fluro Orange Spot sheet, $135. This is a company that inspires you to sing and play. Mostly it inspires you to inject more colours into life. Testament to Castle’s happy vibe is an artwork reading ‘Sing a little la la la.’ It’s $460 and measures 53cmx41cm. Another artwork shows three patched rockets in the perfect blend of bright and pastel colour. ‘3 Rockets’ is $280 and measures 24.5cmx32cm. Artworks are hand stitched or printed in Sydney by the company’s founder, Rachel Castle. Rachel’s mother Jillian also lends a hand, she’s a whiz with needle and thread. There’s something lovely about a mother and daughter team, perhaps this why the company exudes such brightness. Get excited over more cheeky product at the Castle and Things website. See what else excites us in the realm of bedding and wall art in some of our previous posts.